We are warned by the author that this may sting a little. Written during a time of “servitude, debt and disappointment”. But after reading Signposts Vol 1, I understand how they “emerged as honest friends” using his poetry as a means to escape the grief of personal reflection. I adore purchasing petite works, a quick read that helps support the author, a generous sampler to savour. Though this is a short tome, you will find yourself moving back and forth, focused on a thought, walking away, thinking, re reading, getting in between the lines and gaining a better understanding of each stanza. It is placed in pieces, a Haiku drama unfolds. Slivers of humour peer light through the darker poetic visions, wry smiles that ease its maudlin, helping one cope and empathize instead of squirm uncomfortably in somebody else’s misfortune. Many pleasant memories soothe a tired heart and weary mind. He talks of desire, regret, loneliness, relationships, when love breaks down, reminiscence, time – our life factory. 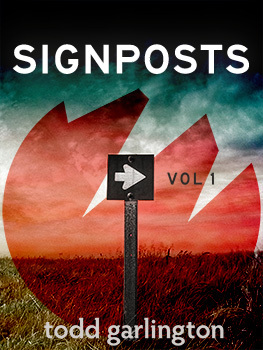 I really enjoyed Signposts Vol 1 and now, Signposts Vol 2 and a back catalogue of Todd Garlington’s work is lined up, ready to contemplate.